The third book in the Wolves of Willoughby Chase series follows one of my favourite childhood heroines, Dido Twite. This is the first book (of quite a few), where she takes over as the main protagonist and she is simply brilliant. Dido wakes up after a long sleep to find herself on a whaling ship with an odd captain who has a strange obsession with a pink whale. Although longing to get home to England, she promises Captain Casket that she will look after his timid daughter, Dutiful Penitence (as Dido would say, “glad I wasn’t saddled with such a handle!”) on the island of Nantucket. However all is not right on the island, and Dido once again finds herself at the centre of a Hanoverian plot to blow up the King in England. Like the previous books, this is a fun and fantastic tale. The writing is just as good as ever, but with the added bonus of Dido’s entertaining phrases. Some of the plot ‘twists’ may be a bit obvious, especially with the return of a baddie from earlier in the series, but it’s all a bit of fun and silliness really! As a child I loved Joan Aiken, and have recently revisited Black Hearts in Battersea to renewed delight. The Wolves of Willoughby Chase was wonderfully atmospheric, though I recall being a bit disappointed by The Cuckoo Tree. 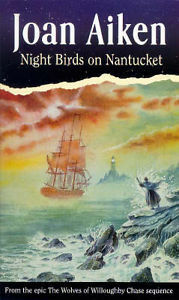 Still hoping one of these days to get to Night Birds on Nantucket… Have you read Midnight is a Place? No Dido or Simon or any of those people, but it’s a brilliant evocation of Industrial Revolutionary England, with the underclass clinging on to existence through life-threatening jobs in satanic mills and London sewers. I most heartily recommend. Thanks for the comment. No I haven’t read Midnight is a Place. Is it part of the same series? I still have to read all of the books. I think Joan Aiken is brilliant, I need to try and read more of her work.